We Care & We Know, at MyAdvo, We Understand You! You are important to us and we make sure to build MyAdvo as the legal services company that can help you in resolving all kinds of legal issues and queries. That is because we care and we know how to do so effectively. Read ahead to find out how MyAdvo looks at its clients! Our laws were created to protect and empower us. However, many of us don't get the help they need because of costly legal fees and various other complexities. Thus, most of us just run away at the thought of legal. When in fact, we should be doing just the opposite of it. We at MyAdvo understand the needs of its clients and looks into their requirements thoroughly, so as to reach a fair conclusion. So if you may wonder at any stage why go to MyAdvo? We have talked about our services at length about how much we believe in keeping a transparent system. MyAdvo offers 24x7 support to you via mail and call. At MyAdvo, we make sure that our case managers are there to keep you in the loop of progress. MyAdvo has a fixed pricing criterion throughout the case proceedings. Since you know how we work, well, even we would want you to research thoroughly about every option and then come to us. Well, that's because we believe in our services and exactly know how to resolve your legal problems effectively. We know that MyAdvo will pop-up first in your mind, no matter what! We're in the business of providing clarity. Whether you use our simplified legal services or educate yourselves with all the legal topics at your disposal through our blogs. For any legal issue, you can rely on us! We're just a call or an email away to give you all the support you need in the tough times. Legal situations can be challenging and we will be there with you standing upright. We are working towards things by making legal-tech services affordable, simple and available to more people than ever before. In a short period, we've been able to build a service that many people can count on and depend to resolve legal issues. At MyAdvo, we spend our time making legal simple and easier for people. As we know it's not something that people generally look up unless facing troubles with the law. We take care of all the legal requirements and prerequisites at MyAdvo, while you can focus on your families and other important things like work, business and more. We combine free legal information with great accessibility to affordable & best representation by licensed lawyers and good attorneys near you. 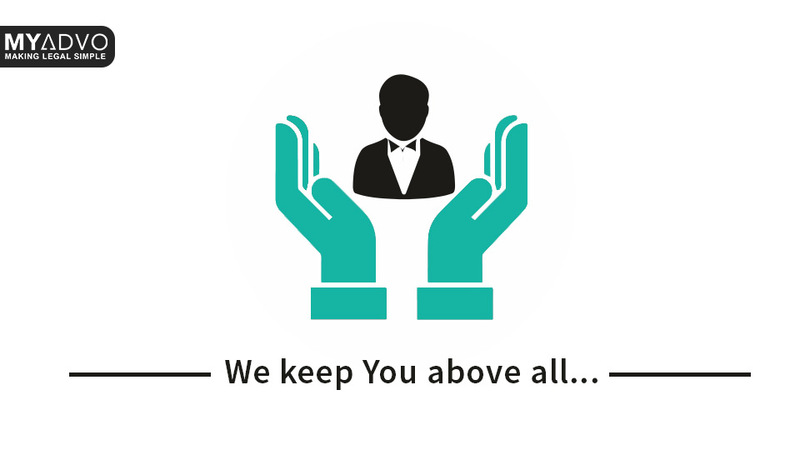 With MyAdvo, you can stay assured to deal with every situation with a strong legal companion, guiding you all the way. From providing the ground knowledge of Indian Law to making sure having timely lawyer consultations, we have got you covered on the MyAdvo App! Our commitment to affordable and accessible legal services is at the heart of everything we do. Most lawyers and bar associations also agree, that much can and should be done to improve accessibility to the law. But doing this at a less cost and complexity is a challenge. This is where MyAdvo steps in! So, let us help you because at MyAdvo we know how to help you. Think legal, think simple! Visit MyAdvo!